You are here: Home / Room Makeovers / Decorating Tips / 5 Bad Decorating Habits to Stop: How to Decorate For YOU! 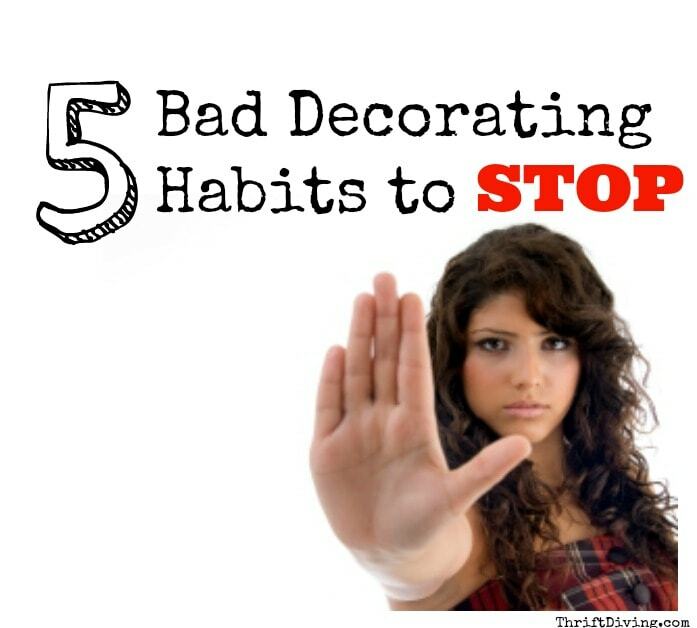 5 Bad Decorating Habits to Stop: How to Decorate For YOU! I don’t know about you, but I second-guess every decorating decision. We moved into this house nearly 7 years ago, and most of the rooms still feel “unfinished” because I just can’t figure out what I want a room to look like. I would like to contribute my lack of decorating productivity to being super busy (just blame it on the kids, right? LOL). But the truth is that I have been making 5 bad decorating habits ever since moving into this house. And it’s time to knock it off, already! 1. STOP asking for permission on how to decorate. If you want turquoise on every square inch of your walls, do it! Why do we need to ask our friends…..our mom…..post it on Facebook to let social media decide how our homes should look? If you like a look, just do it. For me?? I love turquoise. 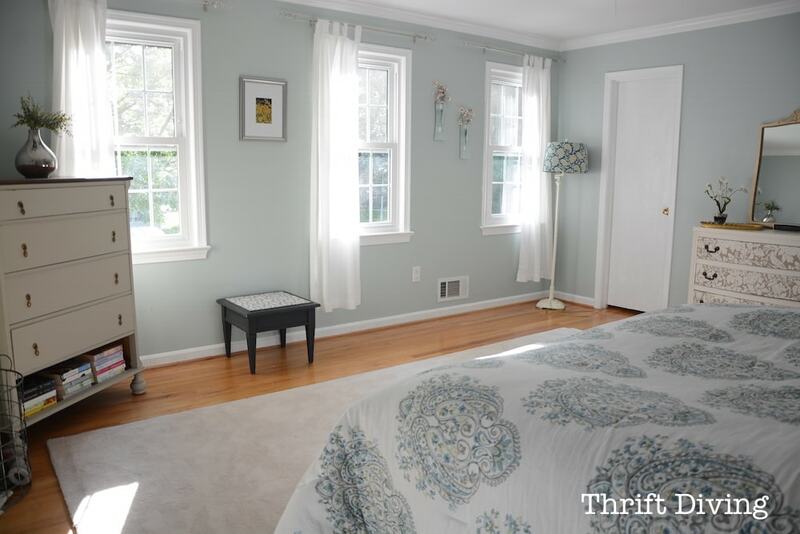 Seriously, nearly all the painted walls in my house are some shade of turquoise-y goodness (my favorites are Sherwin Williams Rainwashed) like my bedroom, and Sherwin Williams Sea Salt in my master bathroom and foyer. 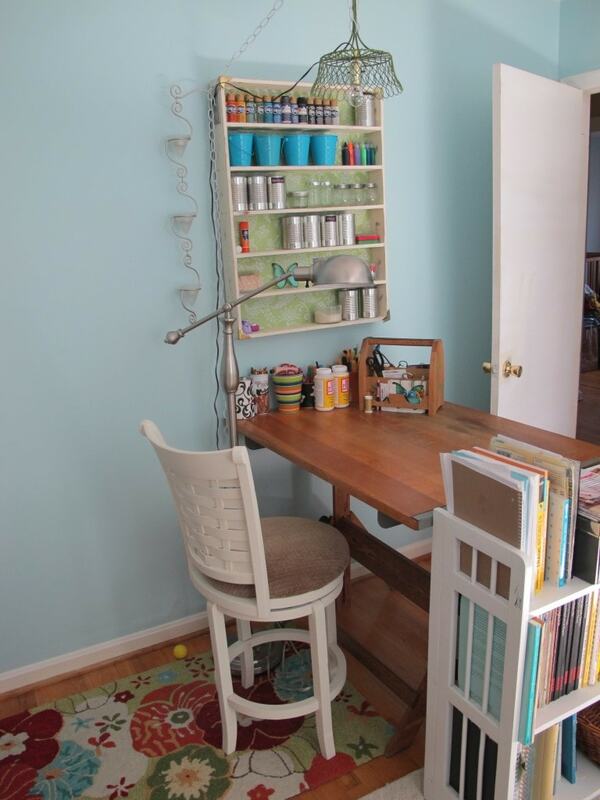 My blogging room is Sherwin Williams Window Pane, with is the lighter version of Rainwashed. 2. STOP ignoring your feelings. I am tired of cringing every time I come home. I want to come home and feel like a queen in a pretty, clean, well-organized home (um, I wish my kids could read this–clean, I say!!). If you’re walking into your home and you’re not feeling like it’s your oasis, it’s time to change some things. That’s what I’m trying to do! Listen to what your gut is telling you, and if something is not working, change it. 3. STOP comparing your home on Pinterest. My house looks nothing like what those other chicks’ places look like. My house feels like an “Eclectic Nightmare” because everything doesn’t fit well together yet, and I have limited time and money to pull a room together to look so Better Homes and Garden-worthy. But you know what? We’ve got to stop this comparison. Inspiration is good, but let’s not have inspiration cause frustration. Let’s appreciate the fact that we even have homes, when so many people are homeless, living out of cars. The home we have, we’ve got to be thankful for it. And make that home as pretty as it can be. And love it for protecting us in cold winters and cooling us in hot summers. Okay, you know how we thrift divers love a good deal (and if you’ve been a long-time reader of this blog, you know I fully support impulse buying at the thrift store.) I have bought many ‘a things just because it was a smokin’ deal. But later, I realize that it’s either “not me” or that I just don’t LOVE it. But for some reason, I’ve got it sitting around for whatever reason. I’m on a new kick now to start buying only the things I love, and leaving the things I “like” for other people that may “love” it! 5. STOP trying to be perfect. Do you struggle with any of these bad decorating habits, too? Leave a comment below and add to the discussion! and somehow, even with a swear word in my search, an angel sent me to you! LOL! I AM GRATEFUL for owning my home. I truly am, I am a HUGE DIY, flea market, thrift store, can’t pass up that bargain loving girl. Your video made me feel better and I thank you for that. I always buy piecesI love but when I get home I realize it has absolutely NO business in my house (along with all the other other mismatched pieces) I need to sit every day and meditate about how I REALLY want my home to look and then just go for it! I will say that whoever designed this house was NOT paying attention to decor detail which probably was much simpler in 1977. Soooo again, Thank You for some inspiration OUTSIDE of Pinterest! The term “eclectic nightmare” could probably be applied to my house as well. I’m a bit tired of the way things don’t seem to match up when I try to decorate. That’s the reason why I’ve decided to start fresh and take my time shopping for decor. Really??? Did you REALLY just say STOP BUYING ANY AND EVERYTHING??? Do you have any idea how much that hurt? I mean, IT’S ONLY A DOLLAR…. I CAN GET EIGHT OF THEM…. I’LL FIND SOMETHING TO DO WITH THEM…. Yep, that is my thrifty life story. And sometimes I really do find good things to do with my stuff. But more times than not they land in the ‘”someday project” pile. I just spent the better part of FOUR HOURS cleaning out my garage and guess what I found? No less than SIX suitcases! You know why they were there? Because I saw ON PINTEREST these really cool vintage suitcase up-cycles and SWORE I was gonna make them. ALL of them! So every time I saw one, I bought it. After all, some of them were literally one dollar! But how many up-cycled bedside tables does one girl need? I think I received this so well from you because, unlike my son who thinks it’s all JUNK (my heart is breaking to think that), hearing another Thrifty say it has value—because non-thrifty’s just don’t understand! Love your blog and I will definitely be back! Keep up the good work! PS… I found you on PINTEREST of all places lol! Searching for vision board ideas and came across your diy wheel of life post– which I’m definitely gonna try! THANK YOU tons! I am guilty of trying to make my Home perfect because of Pinterest.When as you stated it is.I have a home,roof over my head.I can’t express how thankful I am for this blog!!! Awww…thank you, Mac! 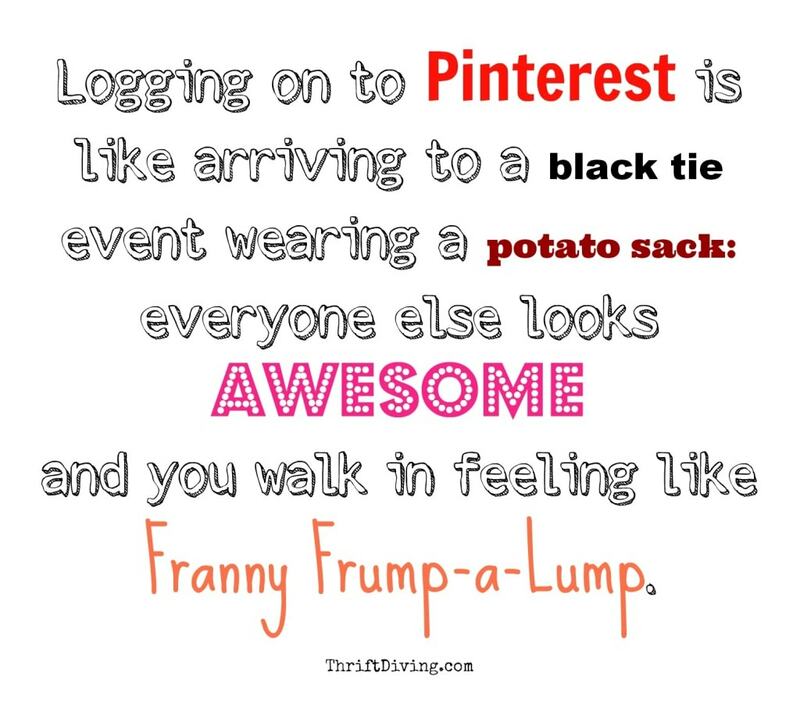 Pinterest is pure evil! LOL. It has it’s good things, but it’s overwhelming to me. I can’t take much of it before I just have to shut it down! LOL 🙂 Glad you are enjoying my blog!! Wow!! We are the same person! I have Rainwashed in family room/kitchen and seasalt in my master! I just bought a teal rug for my living room and thought OMG am I doing too much teal? let’s go on Pinterest and see what others do, only leaving myself wanted to change everything because I loved everyone else design. This was exactly what I needed to read! Thank you!! !